WE HAVE 2 LUXURY WATER/BEACH FRONT CONDO'S...... Beautiful White Kitchen Cabinets, Double Crown Molding thru out, all Tile Floors.......located in BUILDING #1 ON THE 8th FLOOR, and BUILDING #2 ON THE 10th FLOOR... Walk right out the building... into the courtyard....on to Sugar White Sand Beach....... No Streets to Cross.......we are as close as you can get to the Gulf.... When you walk in our foyer... you see water....While preparing dinner you can watch the boats from our kitchen....Gaze at the Gulf while laying in the king-size master bed....Or watch the dolphins and boats from the Living, Dining room...and Balcony. The Views are GORGEOUS from our Destin, Florida condo's, please look at all the pictures....they do not do the condo justice! We share our owner's storage closet filled with beach chairs, umbrella's, boogie boards, floats etc. with our guests. You need only to bring beach towels and binoculars. Now you can leave all that sand outside. Walk to the finest restaurants, shopping, water park. SHORELINE TOWERS is located on Holiday Isle in the heart of Destin, voted one of the most beautiful beaches in the world. The water is a beautiful emerald blue/green color with sugar fine white sand. PLEASE NOTE!!!! OUR RATES ARE UP TO DATE AND LOWER THAN OTHER UNITS AT SHORELINE TOWERS IN BUILDINGS I AND II. ADD $120 CLEANUP FEE AND 11% TAX TO WEEKLY RATE. One trip to Destin and seeing the White Sand and Beautiful Clear Water, we knew this was our second home. The minute we walked in the front door of our units at Shoreline Towers and saw the gorgeous Water Views we were sold. 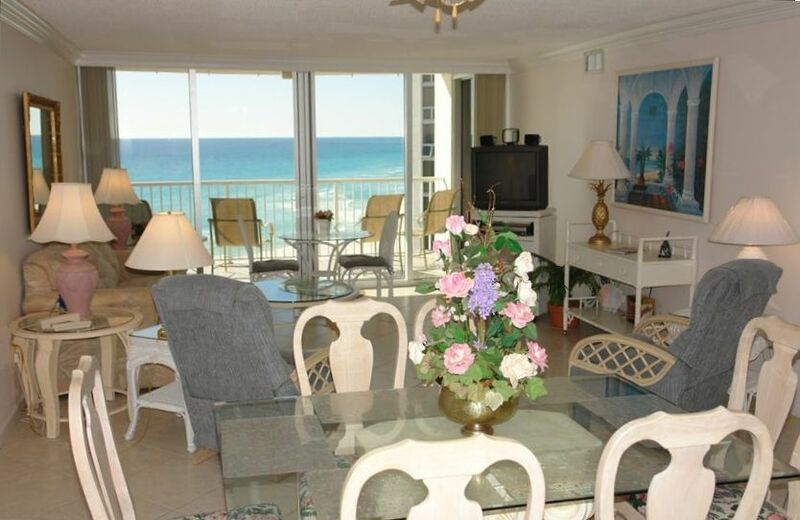 We have 3 beautiful condo's directly on the beach in Destin. You can see the two bedroom units at vrbo #2159, We also have a one bedroom on vrbo #2153. We come down 3 or 4 times a year to make sure that everything is absolutely perfect for our guests. We have people who take wonderful care of our condos when we can not be there. They take care of every little thing that needs to be done. We have a lot of repeat guests that come to our place every year and we are so pleased of the love and care that everyone takes care of our property. We really enjoy shopping and playing house at the condos, I can always think of a lot of reasons to shop and upgrade the condos. We actually work the whole time we are there unless we have company. When we have vistors we take time to enjoy all the great things that Destin has to offer, the great Seafood Restaurants, Shopping, Zoo, Naval Museum in Pensacola, Deep Sea Fishing, Snorkling at the Jetties, playing Tennis, I could go on and on. There is so much to do in Destin. SEE WATER THE MINUTE YOU WALK IN THE DOOR. BEDROOM, LIVING ROOM AND KITCHEN VIEWS. THE VIEW IS UNBELIEVABLE FROM THE MINUTE YOU WALK IN THE DOOR OF OUR 8TH or 10th FLOOR CONDOS, LOCATED IN BUILDING #1 & #2 RIGHT ON THE BEACH. View the Ocean from the condo. kITCHEN IS EQUIPPED WITH EVERYTHING YOU HAVE AT HOME, JUST BRING THE SPICES IN CASE YOU DECIDE TO COOK. WE HAVE A GLASS TOP STOVE. Large Flat Screen in Living Room, 3 Flat Screen Color T V's, 3 DVDs, VCR's, Telephone, Cable, Heated Pool, Fully equipped kitchen, Washer/Dryer in condo, BBQ, Gated Security, Wireless Internet. ABSOLUTELY NO SMOKERS and NO PETS. Saturday to Saturday bookings ONLY! Five stars and two thumbs up!! This was our first visit to Destin and we loved it!! Our condo was perfect for our family.. it had EVERYTHING we needed and the views were breathtaking!! The owner is very sweet and I can’t wait to book for next year!! Beautiful beach, fully-equipped, clean condo with awesome view! Very nice condo with everything we could possibly need! The view from the balcony is stunning. Everything was very clean and owner was great to work with! This was our first time at Destin and it was a great experience. The condo was very clean and everything worked nicely. The sliding doors off of the living room and master bedroom allowed for a spectacular view of the beach. Included with the condo were beach chairs, umbrella, and beach wagon. The wagon was very helpful and made the trips down to the beach a breeze. Barbara was very helpful, organized, and provide clear instructions. We will definitely come back to this condo again. Shoreline Towers is a great location that is within walking distance to the grocery store, pharmacy, and restaurants. Towers 1 and 2 are ocean front and there is easy access to the beach using either a ramp or stairs. The beach was not overly crowded when we stayed at the end of June and I had plenty of room to setup our tent / shelter. Destin has a ton of great restaurants to choose from. We went to non-mainstream restaurants some of which had nice views of the water. Consider trying Boshamps Seafood and Oyster House, McGuire's Irish Pub, The Back Porch, and Bric a Brac (right next to the Shoreline Towers entrance). We loved our stay at Shoreline Towers, specifically this condo. The view was amazing. I loved that we had a straight path to the beach and had no need to cross a road to get there. Everything was nice and clean. The kitchen had everything we needed to make our meals. The washer and dryer came in handy many times. It was conveniently located. There is a grocery store in close proximity as well as lots of restaurants and shops. Just got back from an amazing trip to Destin. We stayed at this beautiful condo. The condo come with everything we needed. We loved the owners closet with chairs and floats to use. We fly so did not want to buy beach toys. The view from the master, kitchen and living room are amazing. Sept/Oct is a great time to go with lower costs, less crowded and easier to get a dinner table. Barbara was a fantastic hostess and worked us when we had to stay an extra night. We will definitely be back. "Ocean View, Ocean View, Ocean View"
This is what you get in all the rooms in this 10th floor condo. Walk from room to room and always have a view of the turquoise water and white sand beach. Well equipped with newer appliances and very clean. Great location for popular restaurants and shopping. Very near the harbor where fishing and sightseeing boats are docked. This was our 3rd stay in Destin and so far the best. Looking forward to staying again. $500 DEPOSIT REQUIRED AT TIME OF RESERVATION, TOTAL RENT FOR STAY, INCLUDING ONE TIME CLEANING FEE, IS DUE ONE MONTH BEFORE CHECK IN, ----- No one under the age of 25 is allowed to rent the condo, The condo must have a parent or legal guardian 25 or older residing in the unit at all times during the duration of the stay. Reservations obtained under false pretenses will not be honored and will be subject to loss of entire deposit and rent paid, We reserve the right, in the event of unforeseen circumstances, to cancel the reservation prior to arrival and refund all monies given. SATURDAY TO SATURDAY RENTALS ONLY! DAILY AVAILABLE ONLY AT LAST MINUTE ~ DAILY RATES ARE $165-$305 DEPENDING ON SEASON! PLEASE ALLOW HOUSEKEEPING INSPECTION BEFORE REFUND DEPOSITS RETURNED BY VRBO OR OWNER! NO SMOKERS AND NO PETS ALLOWED!